The ALS Association’s national electronic newsletter is published monthly as a companion to our semi-annual e-publication Vision Magazine. The newsletter provides the latest news in ALS research and clinical trials, public policy issues and care services information in a concise format. 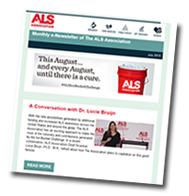 The newsletter also covers ALS awareness activities taking place across the country and other stories of interest to the ALS community. February 2016: ALS Patients at Center of Groundbreaking Effort to Speed Approval of New Treatments / Save the date: National ALS Advocacy Day & Public Policy Conference / Registration is open: Walk with us! / Meet the Yoakum Family: Support like yours makes a difference in their lives! January 2016: Vision for 2016: Moving Forward Together / Hear From a Scientist You're Helping! / We Want to Answer Your Questions About ALS Research! / Advocacy Profile: Sonal Shah / Introducing: Team Challenge ALS! March 2014: Walk Season Begins! July 2013: Take a Swing Against ALS with Covering All the Bases! July 2012: FDA Bill to Accelerate New Treatments for ALS! February, 2012: Introducing Vision Express! The ALS Association's national publication, which covers news and events throughout our community. Vision is published in the Sping and Fall of each year. From our Care Services team, ALS Insight includes stories from people living with ALS, Q&A with medical professionals, tips on daily living and communication.